Board index ‹ The Photo Barn ‹ Time in print. This is the place to post ads, brochures, reviews in print, etc. The collection is growing, but it's not done yet. I finally found this clipping from the Burlington Free Press. I believe Alan had loaned the GS12 to Martin Grosswendt for the evening anticipating the arrival of BB King. That looks like Mark LaVoie in the background. Did he play harp for the Unknown Blues Band? I was wondering when this photo would show up. Thanks! It was not a dream... 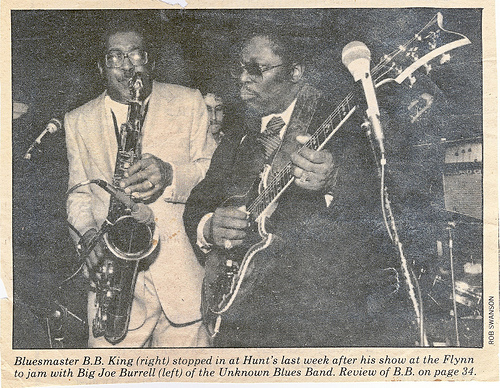 I remember being shocked that B.B.King sounds just like B.B.King no matter what guitar he's playing. That's either Mark or maybe Don Sydney in the background. Rob Swanson still works at the Free Press. I wonder what the chances are that he has this original photo and maybe more? I have a friend that is pretty confident he has this guitar. But he is not really computer literate. It is a GS-12 and the marking on it is DBL 00/1. A. stack. Could this be the guitar? He is interested in selling it but has no idea what it is worth? Thanks for any information you may have to offer. Thanks for the pictures, JillD. Here's a closeup of the headstock. The distinctive inlay pattern and heartwood streak running through the ebony headstock veneer tell us everything. This is the same guitar in the photo. BBKing & Time guitar headstock detail. If possible, can you give us some more history on this guitar? What changes were made and when? Here's a couple of more pictures of this Time guitar that BBKing played @Hunts one night. The odd serial number and signature. How much do you think this guitar would be worth? I can't tell you how much this is worth as the market is still deciding. It's not in pristine condition. The pickguard has been altered, the tune-o-matic bridge and the tailpiece are not original. The pickups are the rare, early hand-wounds from Waltham. Hopefully they both are in working condition. I have not played or seen this guitar. IIRC, this one was built by Alan & John in Darrell's basement and finished at the barn in the early days. I was there, but I was just starting out. I may have done some grunt work on this one. Return to Time in print.